Fettuccine & Meatballs w/ Apple Crumble — Happy Food Co.
1. LET’S GET READY TO CRUMBLE…MIX! COAT bottom and sides of square baking dish with 1 butter ball. 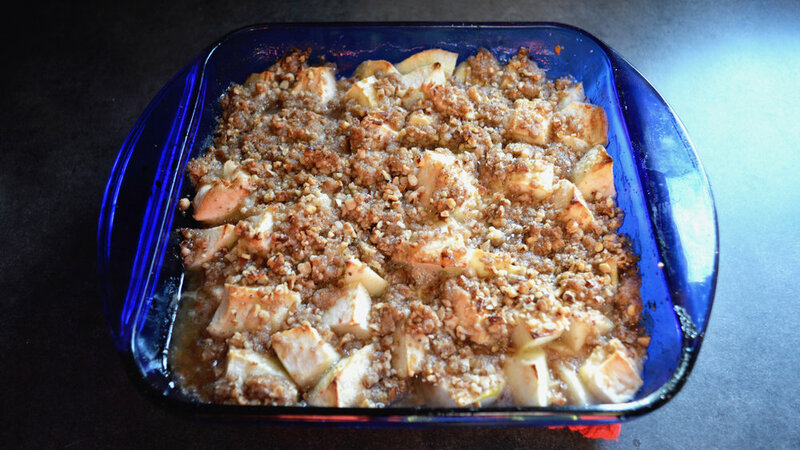 COMBINE the crumble mix, pecans and remaining butter balls in stand mixer bowl or large bowl. BLEND crumble mixture in stand mixer fitted with paddle attachment until the crumble mix resembles coarse sand. If you don’t have a stand mixer, use a hand masher (or food processor) to blend ingredients. Refrigerate. PEEL and core the apples and cut into 2-inch cubes on cutting board. MIX the apples with the sugar and lemon juice in large bowl. POUR the apple mixture in the buttered baking dish. DISTRIBUTE the chilled crumble mix evenly on top. BAKE on middle rack of oven for 40 minutes. Then turn the heat up to 400 degrees and bake for an additional 5 minutes or until golden and bubbly. BOIL water in large stockpot and 1 teaspoon salt. ADD the fettuccine and boil for 15 minutes or until al dente. WARM the olive oil in a large, deep skillet over medium-high heat. 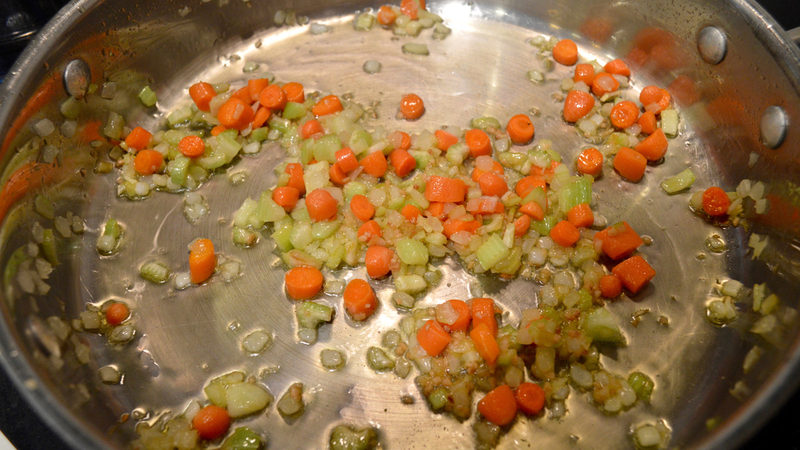 STIR in the mirepoix and sauté until caramelized, about 5 minutes. ADD the garlic and sauté for 1 minute more, then season with salt and pepper. 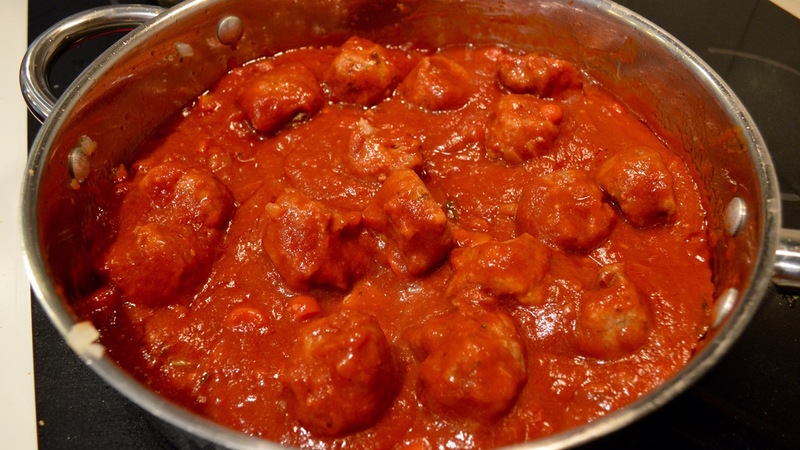 STIR in the marinara and meatballs. Reduce heat to medium and cover with lid. Simmer for 10 minutes. 5. PUT IT ALL TOGETHER, SERVE & ENJOY! DRAIN the fettuccine in the colander and combine with the warm meatball sauce. SERVE the fettuccine and meatball sauce topped with parmesan and parsley. 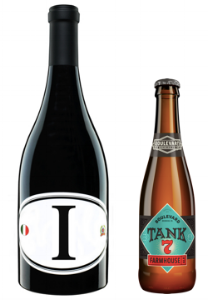 Features intense aromas of dark fruits, spices and wildflowers for the nose and rich flavors of plums, black cherries and mineral components for the palate.